On our way home to Vancouver from Turkey, we decided to stop at London for a couple of days. Two days in London is very short, so we were debating whether we should even spend time at afternoon tea. Of course, the price tag also weighed on our minds. £40 for some crustless sandwiches, a couple of scones and a handful of pastries?!! Pounds, man, pounds, not dollars! 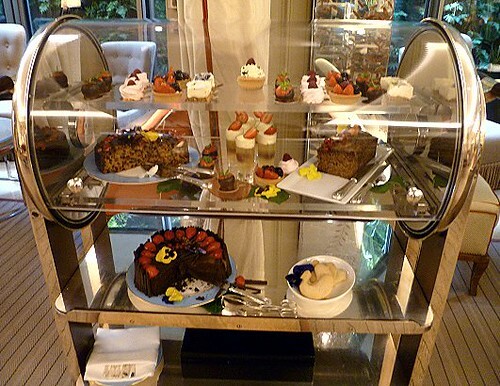 We've indulged in afternoon tea service in Vancouver a couple of times previously, but, we weren't really impressed. Close to $40 dollars for mediocre sandwiches and pastries? Steep. 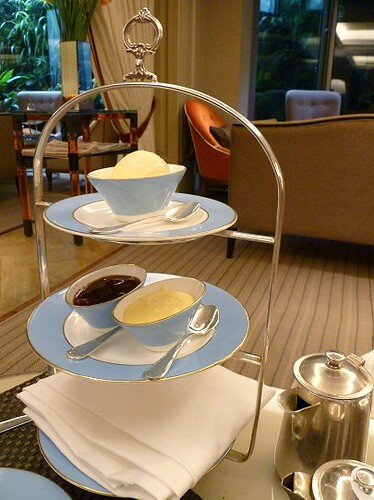 But, I suppose I felt we couldn't get out of London without doing afternoon tea, price tag be damned. 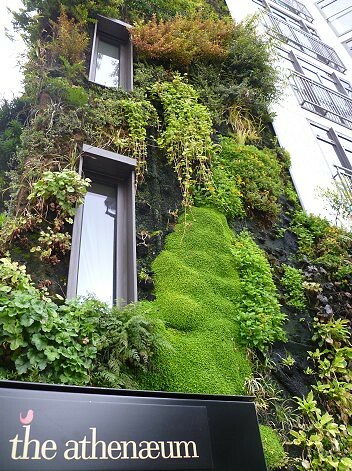 At first, I was set on booking at Brown's Hotel. 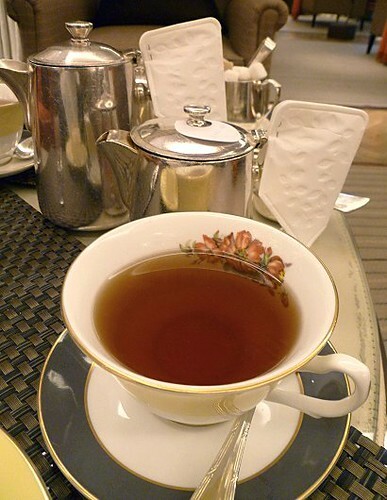 Apparently, they were the first hotel in London (or, at least, one of the very first) to offer tea service. Also, their website promised that "[g]uests of The English Tea Room never leave hungry, as the Afternoon Tea is continuously replenished at no additional charge." But, our itinerary in London allowed us time only on the day of our flight, so we had to have tea earlier than the usual 3 o'clock. This left only a couple of choices. 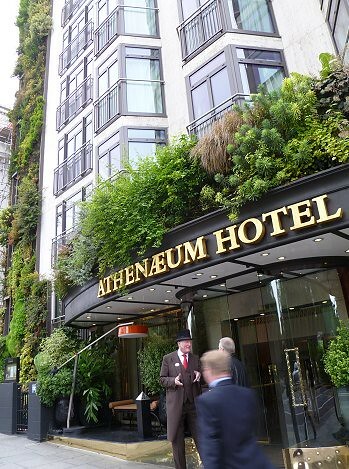 The Athenaeum Hotel was one of the very few hotels that started tea service early, at 12:30pm. A bonus is that their Afternoon Tea costs "only" £27.50. Of course, ladies who do Afternoon Tea have to be, well, lady-like! I think I can safely say that I am not a "lady" in that sense. Since we were still going to be walking about in the morning before tea at the hotel, I could not wear "nice" (and in my mind, "uncomfortable") clothing. Same goes for the shoes. How can I run up and down the stairs of the tube in heels! Insanity! So, our strategy was to wear our usual "casual" (aka ugly) attire, then change at the hotel, donning more Afternoon Tea-appropriate clothing. As we were walking towards the hotel, JS fretted: "What if they won't even let you in, seeing your outfit?" "That's why you have to preempt them and tell them right away that you want to change in the washroom," I replied. As we arrived, they indeed had a doorman at the door. We needn't have worried, though, as the very, very tall gentleman at the door -- he was quite a character, actually -- was exceedingly friendly. He pointed us to the powder room near the lobby and off we went. He didn't seem to bat an eye at our "ugly" attire and even mentioned that he wished he could join us for tea. 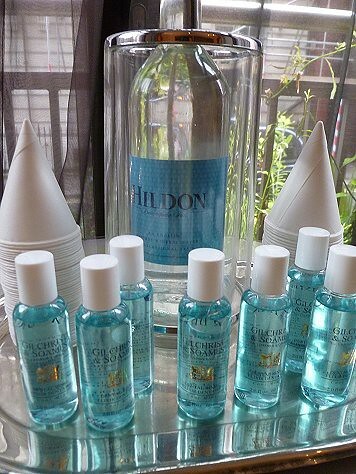 Mineral water and mouthwash in the powder room. Ah, finally, we can change! The powder room was quite nice. 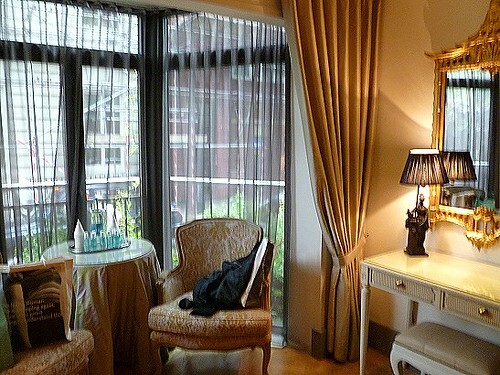 As you can see from a previous photo, there was a nice sitting room area. We plopped down our stuff onto the armchairs and started to unpack our things. I laid out items on one of the vanity tables. We actually took our time in the spacious and luxurious powder room. We sipped mineral water while relaxing on the armchairs. Perfect, especially after the mad running around the city in the morning. 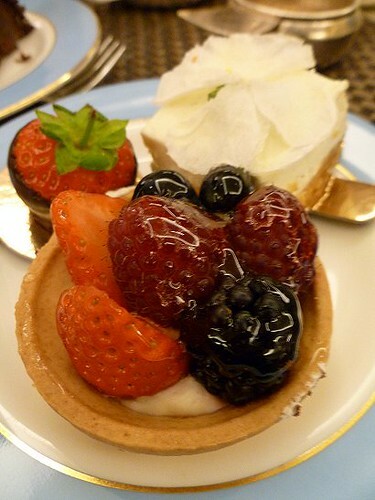 Anyway, on to Afternoon Tea! 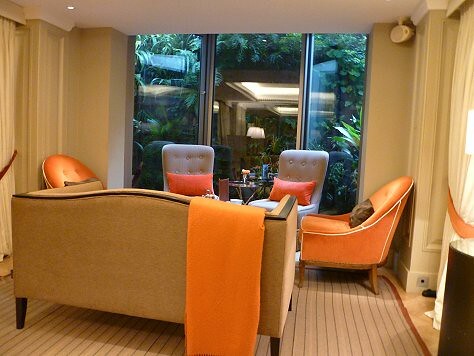 The Athenaeum Hotel has a more modern look and feel than traditional tea rooms, so we were curious as to how this would translate to their tea service. We had the Evergreen Tea service. 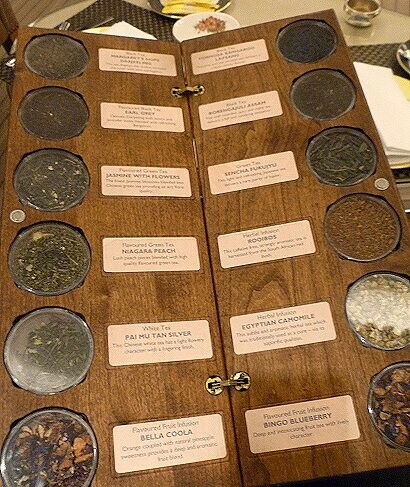 The "book" of teas was a nice-enough way to present their selection, but I would have rather had a chance to actually smell the teas. I was really intrigued by the white tea as I'm not really familiar with them, but JS warned me that I wouldn't be able to add milk and sugar to such a delicate tea. So, in the end, I settled for my old favorite, Earl Grey. JS chose Margaret's Hope Darjeeling. It's been quite a long time since I've had Darjeeling tea -- and this one, at least that first sip, was a tad acidic for me. The longer the tea steeped, the more I could taste the muscatel notes. However, this wasn't the best Darjeeling I've had, unfortunately. Look at all those specialized products for tea service. We were wondering where these paper teapot "mitts" (what are those called?) could be manufactured, if there were companies specializing in manufacturing and/or distributing tea paper accessories, etc. Strangely enough, we were not brought milk for the teas. This was fine by us because we could truly taste more of the tea itself this way, but that meant I could have ordered a white tea after all! The only complaint I have was the tea lost quite a bit of temperature quite quickly. Must be a function of the teapot used in this case? From top to bottom: Cucumber and cream cheese, ham and chutney, cress and egg, and smoked salmon. On the left is a guacamole wrap. You may be noticing that there is no three-tiered tray on the table. That is correct, they did not present the food in those trays. More on this later. My favorite was the cress and egg sandwich. I didn't care much for the guacamole wrap, but thought that the other sandwiches were okay. My favourite also was the cress and egg sandwich, followed closely by the cucumber and cream cheese one. Having said that, the sandwiches were not spectacular by any means. It's all about the experience, I guess, having these crustless sandwiches with the tea of one's choice. They were only using their three-tiered trays to serve the scones! 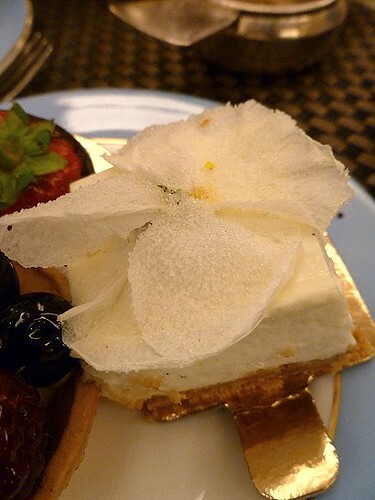 The scones were hiding inside a folded napkin. They were quite small, the cutesies. They were about the size of... hmm, it's actually quite difficult to find an object of a similar size. Perhaps it is slightly larger than a flattened golf ball. 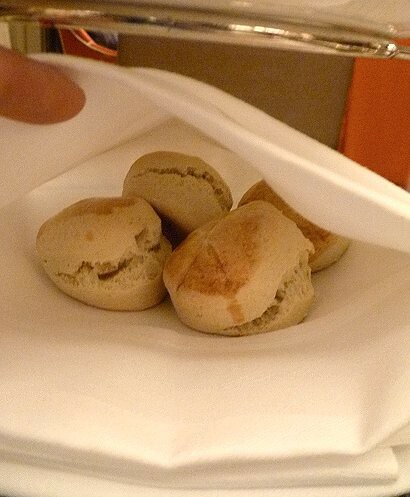 The napkin helped keep the scones warm. I had to keep patting the napkin to make sure that there were no scones still hiding in there. They gave us 2 scones each. 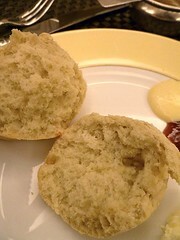 The warm scones were quite nice, similar to a biscuit but with a richer and moister texture. Of course, the best part was eating them with Devonshire cream! I found that the moment they lost their warmth, they were considerably drier and crumblier. Lesson learned: must eat scones warm! The lemon curd and the berry jam were too sweet for my liking. They were superfluous for me. 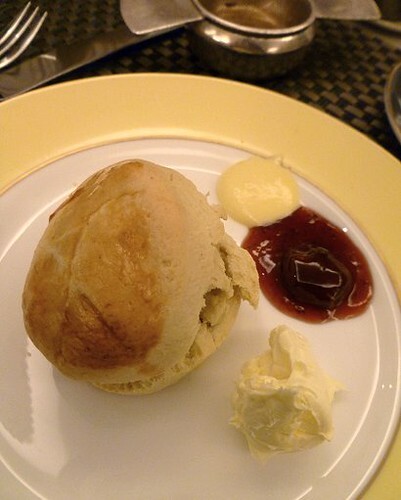 I was a little surprised that I already felt full, not even quite finished with my first scone. Well, I did have 2 servings of each kind of tea sandwich. But still, those sandwiches do not add up to a lot of food. After the scones, the server asked us if we wanted to have a little break before getting to the sweets. We decided to forge ahead because we did not have time to waste. We did have to get to the airport pretty soon, after all. The server wheeled out the cart of pastries and asked us to choose. JS opted for just one slice of the chocolate cake above. The server gave her a not-small slice. I didn't expect much from the chocolate cake, given that I have learned from years of experience that chocolate cakes taste of disappointment (that is, it's hard to find a good one). I was pleasantly surprised that this was quite a nice slice of cake, moist, chocolate-y, with the right crumb. 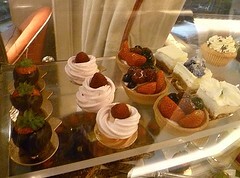 I opted for several small bites: a chocolate-covered strawberry, a mini berry tartlet, and a cheesecake square. Funnily enough, the server told me I could only have 2 pieces of pastries. I thought that was a bit weird, especially considering the 3 items I selected were still less an amount of food than the big slice of chocolate cake that she gave JS! She did a slight backpedal, though, saying that I could take JS' unclaimed second piece of sweets. 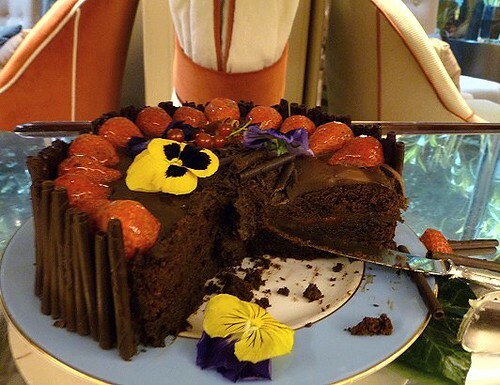 I did ask for a small slice of chocolate cake, given that I was also starting to feel full from the food. Which, again, is surprising, since I didn't think what I ate amounted to much. I think it must be the tea. Sometimes, tea makes me feel full. The other pastries I did not taste -- as I was getting to bursting at about this time. TS said they were "OK", but nothing special. 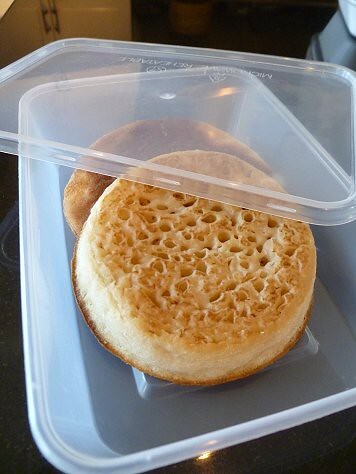 Crumpets in a to-go container, back in Vancouver. JS and I were completely stuffed at this point. But, the server asked us if we would like tea cakes or crumpets. I personally would've liked to get both, especially as I saw another person take home all her leftovers! But, in the interest of time -- we really needed to get out of there -- we decided on the crumpets, seeing as I didn't actually know what crumpets were! We asked her to have the crumpets packed in a to-go container so JS and I could have a snack on the plane should we wish to do so. I eventually tried the crumpets back in Vancouver, and I didn't quite like them. They were more or less tasteless. One is supposed to toast them and perhaps eat them with butter? Yes, the Ladies Powder Room is back in action. After the tea, we had to go change back into our ugly clothes so we could walk fast/run back to the hotel if need be. We went into the powder room, but there was one woman by the sinks. We were waiting for her to finish so we could change. She was taking quite a while. Why did we have to wait for her to leave? Why couldn't we have changed inside one of the stalls in the powder room? Well, if I were to change inside a stall, I would not want to go inside with just my bare (or even socked) feet! However, I had already put away my heels at this point and was too lazy to take them out of the shoebox, which were already back into a shopping bag. But, I couldn't go ahead and wear my running shoes either, because I wanted to change from dress pants to jeans first before putting them on. Imagine wearing bulky running shoes then trying to slip dress pants off of your feet. That's right, I did not want to go through the trouble of putting on running shoes, then going into a stall, then taking off the shoes, changing pants, then putting on the running shoes a second time. Hence, I had to stand there waiting for the woman to leave so I can change. Ah, the price one pays for laziness! After what seemed like minutes on end, the woman finally left the powder room. JS and I sprang into action and started to change our respective pairs of pants. I told her to stand against the door, just in case someone came in. And what do you know, someone came in right at the moment between donning off our dress pants and donning on jeans! The very distinguished-looking lady gave a little yelp of surprise. I quickly mentioned, "We're just changing." She started laughing: "For a moment there, I thought I had gone into someone's room!" The nice lady literally walked in as soon as I bent over, that crucial moment when I had to guide my pants off my feet. I had to shoot back up straight-postured when the door hit my behind and so I dropped my pants to my ankles in the process! All in all, it was a good experience, but it could have been better. I'm still a little disappointed about not having the three-tiered tray. They had the server offer us their selection of sandwiches. Although they did come back again after we were finished with the first round of sandwiches to offer us seconds -- of which I took advantage -- the experience still wasn't the same as having all the food displayed in a tiered tray, of having that visual display of abundance. Also, we were not quite sure if we were "allowed" to have any of the items replenished. Serving the food in courses also seemed a very restrictive way to have afternoon tea. 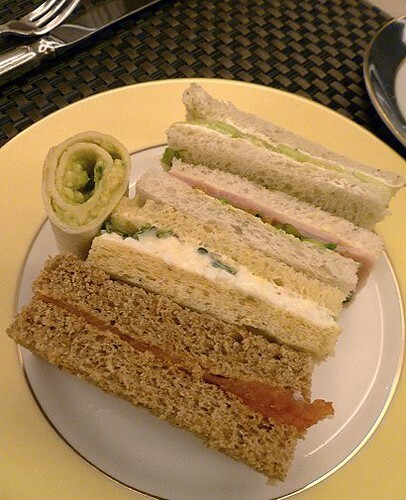 If they used the three-tiered tray, then I would have enjoyed alternating between the sandwiches, scones and sweets, instead of being forced to be "done" with a certain food before I can enjoy another. We definitely need to experience Tea in a more traditional setting the next time around. I think we might have been too rushed to enjoy the entire afternoon tea experience. I was constantly looking at my watch, because we did have a flight to catch that day. The whole stress might have coloured my experience of this afternoon tea. While I didn't love it this time, I must say I can see myself very easily, too easily, falling into the habit of having tea, sandwiches, and scones in the afternoon. Oh, what it must be like to live a life of leisure! I enjoyed your accounting of your last day in London -- and have confirmed to myself why I never had interest in going to a tea service. Nothing appealed to me other than your delightful story. Aww, I would've felt ripped off with so little food and paying for it in pounds. Pounds! But that restroom is exceedingly nice. And I would've thought their floors would've been very clean for you to change in a stall? I am planning to stop in London for tea service (I even have my English cousin taking me) but I hope it will turn out to be more grandiose than this! 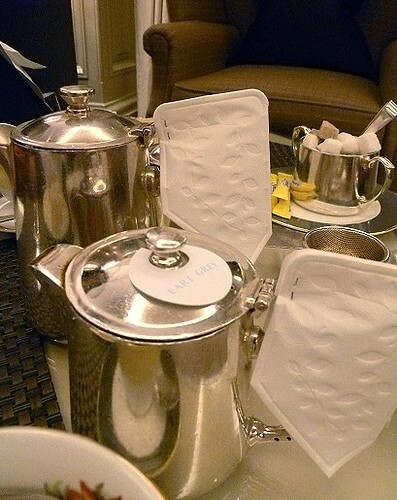 Frankly drinking tea at Marriage Frères in Paris is better and the tea comes in cast iron pots; the scones looked Ok. 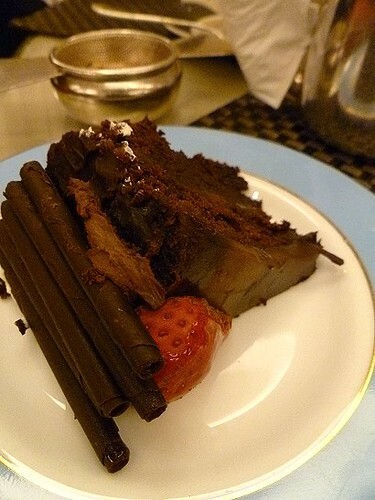 I am glad at least the chocolate cake was good; I agree with you, I have stopped ordering chocolate cakes in restaurants in Dallas, because it always ends up tasting like a box. Pounds! I do agree with WC on that. Funnily enough, both times I was in London, I didn't actually -take- afternoon tea. And now I can't because of all that flour! Never mind. I'll have to make my own. Oh, the modified red braise with the mushrooms and tofu came out -stellar-. Here's what happened! Sounds like a great experience, even though it wasn't the way you had imagined it. I guess that means you will have to take another trip to London and try some other tea spots! :) Really enjoyed the post! I've never heard afternoon tea referred to as AYCE before, hehe. We didn't get to go to that one (at the Brown's Hotel). But if we did, we definitely would've allotted the whole afternoon. Strangely enough, it was kind of a lot of food. I was really, really, really, really full! I actually wanted to book a seating at the Ritz. But I was quite surprised that they were fully booked, even though I tried booking a monht in advance, and for a WEEKDAY, and at such an "early" (noon instead of mid-afternoon) time! Yes... it was still a nice way to pass the time. Teehee, I know! Now I'd really have to go back to London! Haha... well, you know how we like to be incognito on the blog. But, I can say that our "nice" clothes still will NOT be considered anywhere near "nice" by real fashionista types. LOL. 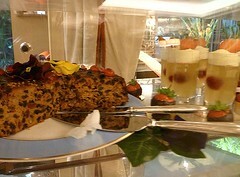 I;ve never heard of this hotel but the afternoon tea looks to die for. Somewhere different for a cuppa in this cold weather. Hi - first visit to your blog, and this very enjoyable post, but I just wanted to confirm that crumpets are toasted and then spread thickly with butter before eating. Enough butter to fill the holes when it melts! Jam, honey or lemon curd, or even a savoury spread, on top of that is also an option. Crumpets are a bit like bagels in that they change texture when hot, becoming much lighter!